Sitting in an upholstered chair in a room at Drumthwacket, the governor’s mansion, Mr. Christie defended Mr. Trump as well as his own role in the transition, which he said went off the wheels after his departure and was the reason for “75 percent” of the president’s woes last year. To this day, Mr. Christie said he is unsure of what the president knew about his dismissal. (A new book about Mr. Trump by the author Michael Wolff suggests that it was at the request of Ivanka Trump). As for his own thwarted presidential ambitions, he had a simple response to a question of whether he believes that without the Bridgegate scandal and Mr. Trump’s entry into the race, he could have been the Republican nominee in 2016 and living in the White House today. Asked about his low approval ratings in New Jersey, the crisis over the state’s infrastructure, and its budget struggles, Mr. Christie said there was little that he would do over. Mr. Christie has consistently said he knew nothing of the plot to shut down lanes leading to the George Washington Bridge to punish a Democratic mayor, but he believes that the drumbeat of coverage helped sink his presidential ambitions. Still, in retrospect, he acknowledges there were signs of trouble for him within the Republican Party even before his long-delayed debut in Republican presidential politics. His appointment of a Muslim to a state judicial post in 2011 was the subject of an intense backlash among some parts of the Republican base. Mr. Christie dismissed the criticism of Sohail Mohammed as led by the party’s “crazies,” but the moment signaled the hard-right turn that Republican primary voters were prepared to take on the subject of Islam and immigration and the unlikelihood they would support a northeastern governor trying to drive the party in a different direction. 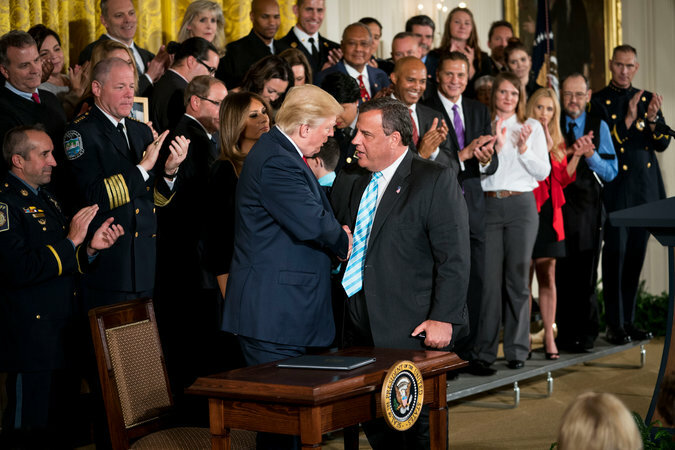 President Trump declared the opioid crisis a public health emergency in October and gave Mr. Christie one of the pens used to sign the memorandum. “It was very difficult as a candidate out in ’16 having the record that I have to explain that to people in the context of that conversation,” he said. Mr. Christie’s defeat of Jon S. Corzine, the Democratic incumbent, in 2009, his focus on pushing public-sector union workers to increase their contributions to the pension system and starting “the national conversation” on the issue, and his combative style had cemented him as a national figure and a possible Republican presidential nominee in 2012 before he decided it was not his time. But after he won re-election in 2013 after declining to be a candidate the year before, budget realities set in. Faced with a shortfall after economic growth in the state had lagged, Mr. Christie pulled back on more than $1.5 billion in promised payments to the pension fund in 2014, and by the end of his tenure, Mr. Christie had overseen more credit downgrades than any governor in history. Before the scandal, Mr. Christie believed voters viewed him as a tough guy who had their back, who was working in their own interests. The trust that independents and Republicans initially placed in Mr. Christie evaporated, seemingly overnight, his brash, tell-it-like-it-is demeanor that was once so effective was now rendered moot. With Mr. Trump in the White House, Washington beckoned as a solution to his disappointment. Mr. Christie was offered a range of jobs but none that he found compelling enough to leave New Jersey. The one that his allies believe he would have been the best fit for, attorney general, went to Jeff Sessions, an Alabama senator and early Trump supporter. Instead, Mr. Christie agreed to co-chair a bipartisan commission on the opioids crisis, which he compares to the 1980s AIDS crisis and which he had focused on in his own state for years. And in New Jersey, he made opioids a central focus of his final year in office. The governor praised Kellyanne Conway, the White House counselor, as a smart pick to be point person within the West Wing on the opiod issue. Ms. Conway and the chief of staff, John F. Kelly, are among the handful of advisers who Mr. Christie cites as serving Mr. Trump well. He faulted James B. Comey, the fired bureau director, for his news conference about Hillary Clinton’s email server, saying that immediately injected politics into a longstanding policy of not commenting on an investigation. But he praised Christopher A. Wray, his personal lawyer during the Bridgegate investigation and Mr. Comey’s successor. What comes next for Mr. Christie after the Jan. 16 swearing in of his successor, Phil Murphy, a Democrat, is unclear. He has had conversations with television networks, as well law firms and private investment firms. Despite his low poll numbers, his fellow governors still treated him with admiring deference at the Republican Governors Association conference in Austin, Tex., late last year. But Mr. Christie said that public service remains his calling.